Hi there! 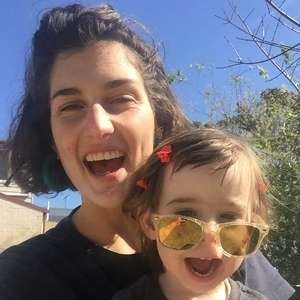 I’m Gabby, a 26 year old casual music teacher at Reddam Bondi for K-2, as well as part-time nanny for two lovely families (17 month old in Leichhardt and a 3.5 year old in Annandale). I am warm, bubbly, responsible and reliable, and would love to do some more nannying work. I absolutely love nannying, and as well as teaching, I am a jazz singer, and while singing some evenings I would love to help out with casual babysitting on my free nights, or daytime nannying/babysitting. I currently have Tuesdays from 11am free and Wednesday’s free all day, as well as evenings free to babysit. I have my WWCC, police check and can provide references. I am experienced with children through swim teaching, my current work of teaching singing lessons for children aged 7 and up, as well as baby-sitting for a number of families from around the age of 18. I have just completed 6 months of music teaching at Reddam Early Learning centres in Lindfield and St. Leonard’s, taking music classes of up to 15 children. I also currently teach K-2 casual music classes at Reddam Bondi. In the past two years I have babysat for 7 different families during my studies among other work. These roles have ranged from one-off roles to weekend and evening babysitting for the same family. I have cared for children between the ages of 4 months and 12 years old, and for families with up to three children. I currently nanny for two beautiful a beautiful families in Stanmore, doing before school drop-offs and after school pickups for two 6 year olds, and a 5 and 7 year old. Last year, I nannied for two lovely families in Russell Lea and Drummoyne. The first role required me to get the gorgeous two 7 and 9 year old girls ready for school, pack their lunches and walk them 15 minutes to school. The second role involved picking up a really fun boy and girl from school, giving them afternoon tea and getting activities/afternoon tea and homework sorted, then picking up their two year old brother from daycare. Since I have finished university, I would like to get back into babysitting, because it really is the best job.